The Japanese car manufacturer launched the classy-looking 2015 Toyota Camry face-lifted variant for US-specified markets at the New York Auto Show in April this year and now moves on to launch the 2015 Toyota Camry facelift globally, at the Moscow Auto Expo next week. Toyota released a teaser picture of the new face-lifted Camry, just to create a buzz and make people anticipate what the 2015 Toyota Camry facelift has in store. The picture depicts a more conservative styling as compared to the sporty US Camry facelift. 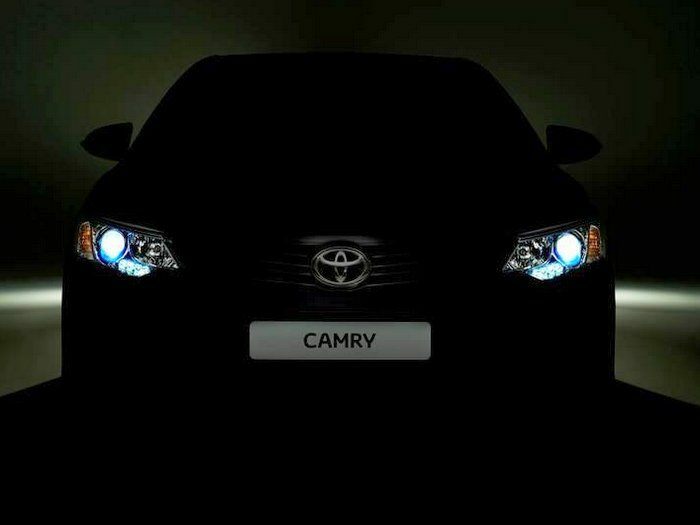 The front fascia seen in the carefully blackened picture, showcases a new headlamp with projectors and daytime running LEDs, the front grille seems to be smaller with a bigger Toyota badge sitting in the center and familiar wing mirrors. New bumpers, wheels and a redesigned combination of lights should sum up the exterior changes. Nothing is specified about the interiors, but we can expect a few added gimmicks in the cabin. Under the hood, most like the facelift Camry will carry over the same Powertrain options- a 2.5 liter, four-cylinder, petrol engine, which produces 181 PS of power and 233 Nm of torque, which is mated to 6-speed automatic transmission and a more powerful 3.6 liter, V6 engine, which belts out 205 PS of power and 270 Nm of torque. The Toyota Camry is currently being built through the CKD (Completely Knocked Down) route and the 2015 Toyota Camry facelift will follow the same route. We hope to see the 2015 Camry facelift later this year or early next year and the Camry facelift may be priced approximately between Rs 25 lakhs- 30 lakhs (ex showroom), putting it in competition against the VW Passat and Skoda Superb. For now this is all we can tell you about the 2015 Toyota Camry facelift, but stay tuned for more updates closer to the launch.